Morning is the time to help your body cleanse toxins from your system. This dark, sweet, and spicy blend is gently diuretic while supporting healthy potassium levels. The anti-inflammatory and pain relieving qualities of white willow are especially helpful for those of us with morning inflammation from arthritis. Variations:Add fresh grated ginger for a hotter, spicier tea. 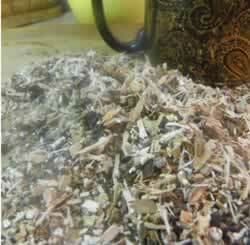 Add a teaspoon of chopped reishi mushroom for more energy. Recipe Instructions: Decoction :Use 1 tablespoon of mix to each cup of water. Bring to a boil slowly over a low flame and simmer for at least 10 minutes. Steep until cool enough to drink. Make enough for a 2 to 3 cups to drink during the day.